Robots the size of skyscrapers are back for another sequel in Pacific Rim: Uprising and what a joyous return to see them in action once again! 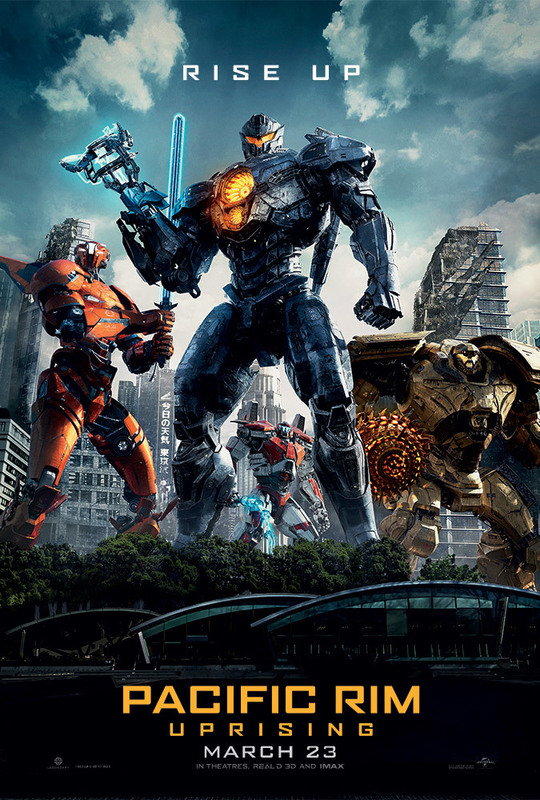 Pros: I love big robots but I knew Pacific Rim: Uprising would either be a hit or miss because sequels usually are. Walking out I really couldn't decide which one was better and that's good. The new designs on the Jaegers were more appealing to me this time around. Action scenes were epic! The story was not something I was expecting and if you really enjoyed the first movie then the story in this really made sense and I liked the direction it went with that. John Boyega really can act beyond Star Wars and that is exciting because he's very likable on screen. Cailee is another actress I've never seen before and she has promise as well. In the first installment it was mostly Jaegers vs Kaiju but this time around we get good Jaegers vs bad Jaegers and seeing such conflict against two robots pitted against each other is just as exciting. There is a brief scene towards the end that shows a statue of a Gundam, since the first movie that is what Jaegers reminded me of -- Mecha Japanese anime that I adore, so seeing that on screen was something that made me smile. Cons: There were scenes with forced humor and some cringy moments as well and while it didn't get in the way of the movie it could have been cut out and used that extra dialogue for other scenes instead. Charlie Day is a character and sure is funny, but I didn't like the way he was used in this flick. I can see why he was used in such a way to progress the story but maybe I just need to let it soak in because I guess it needed to be done. I didn't really like the ending because it abruptly ends in a way that they hope will get another sequel, so fingers crossed that it happens, otherwise ending it like that was not smart. I may just have goggles on that can't really see the negatives of Pacific Rim: Uprising because some critics are giving it a low score or even a mediocre one but I really enjoyed it. Don't go in thinking too much about it and have a fun time. If you liked the first Pacific Rim I hope and assume you will like this one too!